This makes very sanitary antenna installations easy. Your radio manufacturer may not recommend this, but I can tell you from 3 years experience, they work great. I think that the ground range is better with this antenna than it is by running it out the tail. I am using it in all of my racers, electrics, and sport aerobatic airplanes. They are simple to make. The only thing that you have to buy is about 3" of 3/8" shrink tubing. The blue tube that I use is a straw for the tall cups from the nearest 7-11 or what ever they are called in your area. about 6" of the wire between the receiver and the end of the tube. The winds are about 3/8" apart. Make them as neat as possible, but do not get carried away with it. When you get to the end, from the outside place the wire through the hole in the other end of the straw. Pull it tight and put the shrink tubing on that end. Next step is to put about 1 1/2" piece of shrink tubing where you want to attach the Velcro to the tube. If you use a shorter straw, then make the winds closer together. 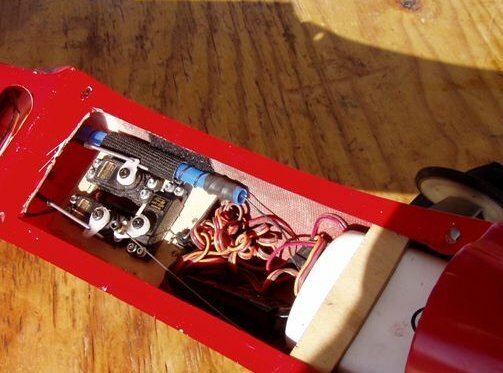 Put matching Velcro on the inside of your fuselage and install your receiver and antenna in one piece.